Every other year, the good people at Moz conduct a survey with one goal in mind: understand what we (SEOs) want to read more of. If you haven’t seen the results from 2017, you can view them here. I can definitely relate to these challenges. I’ve been at Distilled for a few years now, and worked in other firms before — these challenges are real, and they’re tough. 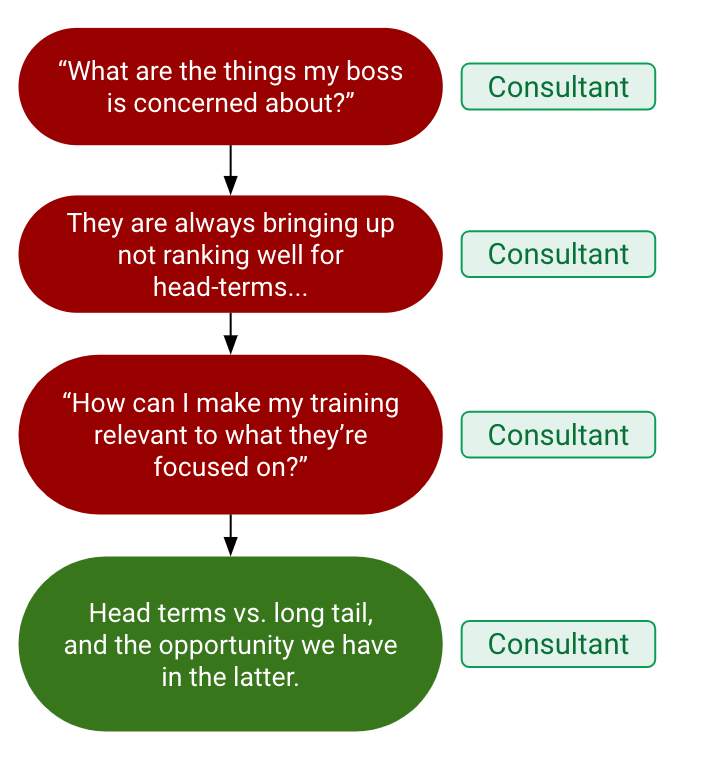 Through sharing my experience dealing with these challenges, I hope to help other consultants and SEOs to overcome them. 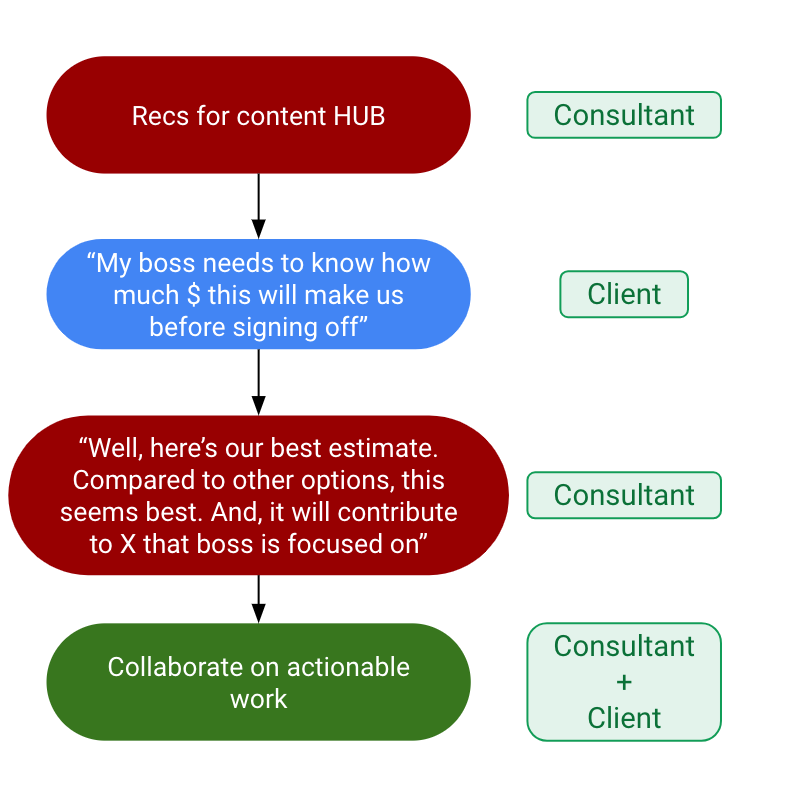 In particular, I want to discuss three points of disconnect that happen between SEOs and clients. My client doesn’t understand the value of SEO and it’s difficult to prove ROI. My client doesn’t understand how SEO works and I always have to justify my actions. My client and I disagree about whether link building is the right answer. Keep in mind, these are purely my own experiences. This doesn’t mean these answers are the end-all-be-all. 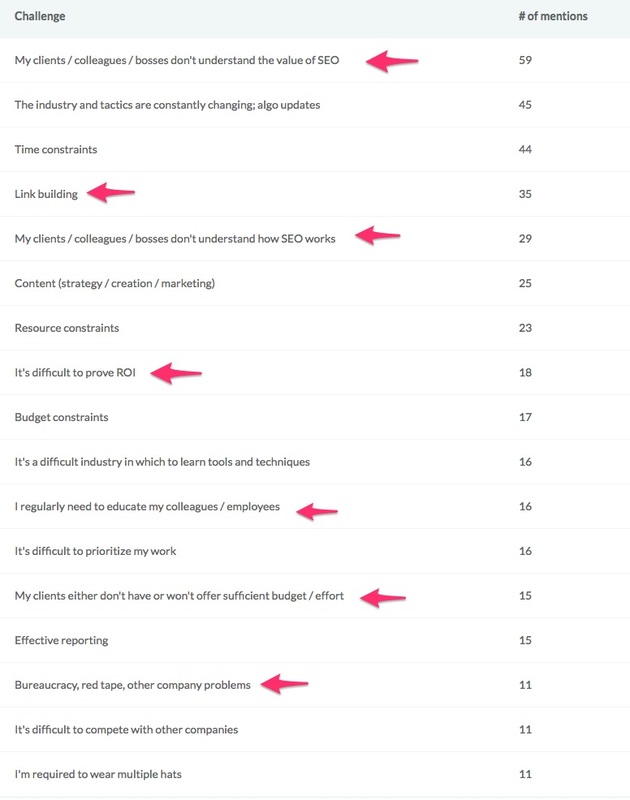 In fact, I would enjoy starting a conversation around these challenges with any of you so please grab me at SearchLove (plug: our San Diego conference is selling out quickly and is my favorite) or MozCon to bounce off more ideas! The value of SEO is its influence on organic search, which is extremely valuable. In fact, SEO is more prominent in 2018 than it has ever been. To illustrate this, I borrowed some figures from Rand’s write up on the state of organic search at the end of 2017. 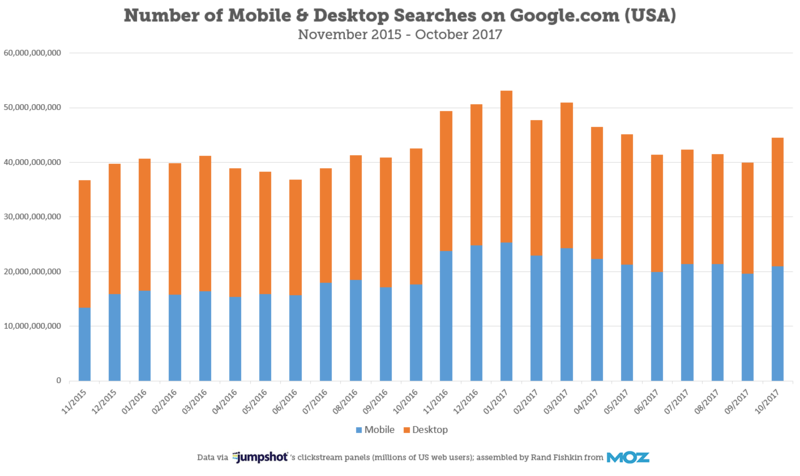 Year over year, the period of January–October 2017 has 13% more search volume than the same months in 2016. That 13% represents 54 billion more queries, which is just about the total number of searches Google did, worldwide, in 2003. 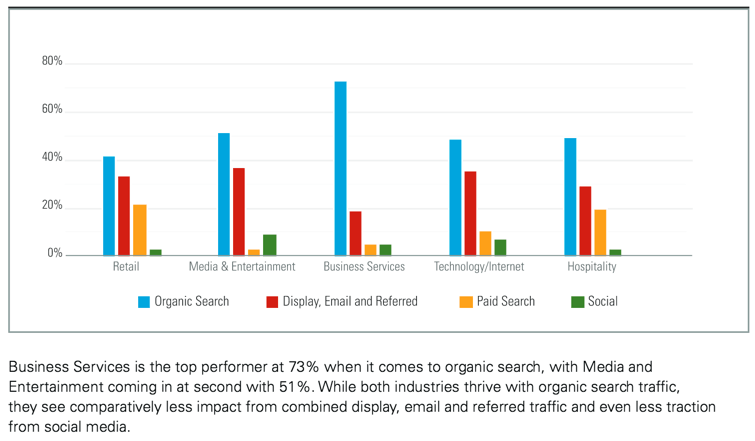 Organic search brings in the most qualified visitors (at a more consistent rate) than any other digital marketing channel. In other words, more people are searching for things than ever before, which results in more potential to grow organic traffic. How do we grow organic traffic? By making sure our sites are discoverable by Google and clearly answer user queries with good content. When I first started out in SEO, I used to think I was making all my clients all the moneys. “Yes, Bill, if you hire me and we do this SEO thing I will increase rankings and sessions, and you will make an extra x dollars!” I used to send estimates on ROI with every single project I pitched (even if it wasn’t asked of me). After a few years in the industry I began questioning the value of providing estimates on ROI. Specifically, I was having trouble determining ift I was doing the right thing by providing a number that was at best an educated guess. It would stress me out and I would feel like I was tied to that number. It also turns out, not worrying about things that are out of our control helps control stress levels. I’m at a point now where I’ve realized the purpose of providing an estimated ROI. Our job as consultants is to effect change. We need to get people to take action. If what it takes to get sign-off is to predict an uplift, that’s totally fine. In fact, it’s expected. Here’s how that conversation might look. Don’t overthink this too much — if you do, you’ll get stuck in the weeds. When requested, provide the prediction to get sign-off and quickly move on to action. For more in-depth thoughts on this, read Will Critchlow’s recent post on forecast modeling. Remember to think about seasonality, overall trends, and the fact that few brands exist in a vacuum. What are your competitors doing and how will that affect you? 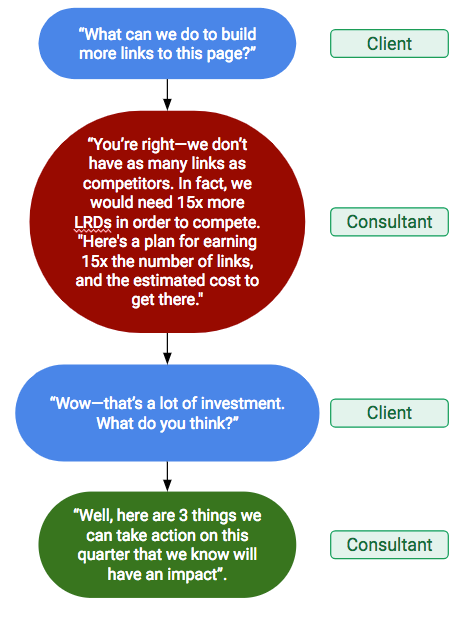 Does your client actually not understand how SEO works? Or, could it be that you don’t understand what they need from you? Perhaps you haven’t considered what they are struggling with at the moment? I’ve been there — constantly needing to justify why you’re working on a project or why SEO should be a focus. It isn’t easy to be in this position. But, more often than not I’ve realized what helps the most is to take a step back and ask some fundamental questions. What are the things my client is concerned about? What is my client being graded on by their boss? Is my client under pressure for some reason? You might know more about SEO than your client, but they know more about their company. This means they may see the bigger picture between investments, returns, activities, and the interplay between them all. SEO might be 20% of what your client needs to think about — imagine a VP of marketing who needs to account for 5–10 different channels. If you didn’t get sign off/budget for a project, it doesn’t mean your request was without merit. This just means someone else made a better pitch more aligned to their larger goals. When you have some answers, ask yourself, “How can I make what I’m doing align to what they’re focused on?” This will ensure you are hitting the nail on the head and providing useful insight instead of more confusion. This is a good problem to have — it means you have a chance to effect change. Also, it means that your client is interested in your work! The topic of whether links (and by extension, link building) are important is perhaps the most talked about topic in SEO. To put it simply, there are many different opinions and not one “go-to” answer. In 2017 alone there have been many conflicting posts/talks on the state of links. The quick answer to the challenge we face as SEOs when it comes to links is, unless authority is holding you back do something else. That answer is a bit brief and if your client is constantly bringing up links, it doesn’t help. In this case, I think there are a few points to consider. If you’re a small business, getting links is a legitimate challenge and can significantly impact your rankings. The problem is that it’s difficult to get links for a small business. Luckily, we have some experts in our field giving out ideas for this. Check out this, this, and this. If you’re an established brand (with authority), links should not be a priority. Often, links will get prioritized because they are easier to attain, measurable (kind of), and comfortable. Don’t fall into this trap! Go with the recommendation above: do other impactful work that you have control over first. Reasoning: Links tie success to a metric we have no control over — this gives us an excuse to not be accountable for success, which is bad. Reasoning: Links reduce an extremely complicated situation into a single variable — this gives us an excuse not to try and understand everything (which is also bad). It’s good to think about the topic of links and how it’s related to brand. Big brands get talked about (and linked to) more than small brands. Perhaps the focus should be “build your brand” instead of “gain some links”. There are many opinions on the state of links in 2018: don’t get distracted by all the noise. If you’re a small business, there are some great tactics for building links that don’t take a ton of time and are probably worth it. If you’re an established brand with more authority, do other impactful work that’s in your control first. If you are constantly getting asked about links from your client, paint a realistic picture. If you’ve made it this far, I’m really interested in hearing how you deal with these issues within your company. Are there specific challenges you face within the topics of ROI, educating on SEO, getting sign-off, or link building? How can we start tackling these problems more as an industry?